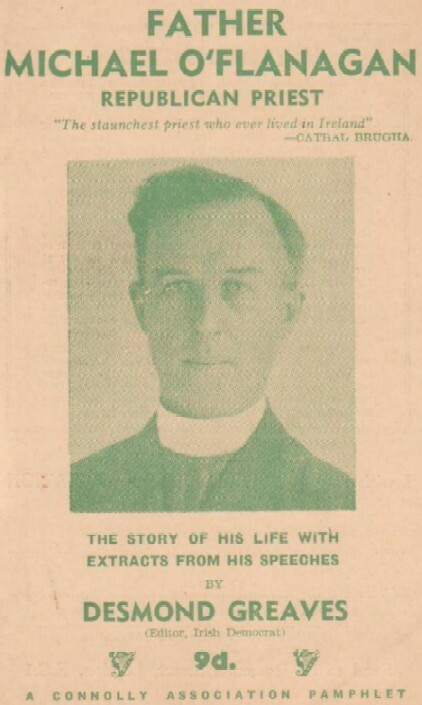 A lenghthy Pamphet produced by The Connolly Association in 1954 , “Father Michael O’Flanagan -Republican Priest”. Written by Desmond Greaves. It is the Story of his life with extracts from his speeches. “The Staunchest Priest who ever lived in Ireland” wrote Count Plunkett. A summary of Father Michael O’Flanagans life can be read here. Many many thanks to the donor. Funny how the very things that Flanagan railed against during his life – bad politics, poor politicians, lack of understanding by politicians of what the people actually wanted, elite groups running the country etc. are the very things now plagueing the “Repubican” party that would claim his inheritance! They say those who ignore history are bound to repeat it …. never a truer word! Thanks for popping this one up ! A very interesting read. Fr O Flanagan is quite popular in our house ! The link to the summary of his life might give you a clue why ! I see the connection now. Must be a great book! If you have any more material related to Father O’Flanagan either myself or more so Liam Byrne would be thrilled to get it. “They Have Fooled You Again” – what a fabulous synopsis of politics in Ireland today! Thanks Paddy! BTW – I was the successful bidder at Mealys / Adams today for the Count Plunkett election badge (part of lot 95). I’ve never seen this badge before so I hope it’s genuine! Another great link to this man! I will send you a scan for the site Alan, when I get it home! Congrats Liam on your successful bid. What did that other lot (The Haughey posters etc) go for? Will have to look that up next week when prices go online! Will post it here then! Didn’t have to wait: lot 402: 4 x SF posters (not recent, no date given) €100, lot 411: 40 x FF/FG/Ind/Lab posters (last 20 years or so) €160 (this the one you were looking at – not bad price if you’re a buyer? ), lot 493: FF collection (leaflets, passes, documents etc – big collection 1930’s – 1940’s) €1,400, lot 494: 6 x FF posters plus other leaflets etc. (1940’s) €650, lot 495: 3 x FF posters (1940’s) €380. Some prices were up (1916 – 1924 stuff especially) some down (WW1 posters? ), some items didn’t sell, some huge -prices! Am happy with mine! 🙂 L.
well done. Thats a good price alright for the posters (or I would have thought so). I suppose you could do a rough estimate – early posters (1930’s – 40’s) = about €100 each. Late twentieth century = about €25 each. Depends on personality, place, design, subject etc. Getting forty together is a great catch – they might start to appear singly or in smaller groups from now on? I suppose it depends on whether anyone else is interested in them – apart from you and me, that is? The NLI and NAI have collections and they may have bought these? The FF stuff might have gone to UCD – they already have the FF archive?? ?